On April 25, 2015, a 7.8 earthquake hit Nepal near the capital city of Kathmandu, the worst of its kind in more than 80 years. More than 9,000 people lost their lives, a further 23,000 were injured and the major destruction of homes infrastructure. The earthquake resulted in more than 5,000 schools being damaged or completely destroyed. On May 12, 2015, a second 7.3 earthquake struck the country, causing further devastation and loss of lives. 72 hours after the first earthquake, All Hands and Hearts – Smart Response were on the ground assisting the affected communities. Following and exceeding three years in Nepal, All Hands and Hearts has touched more than 22,000 lives through our response and recovery efforts, putting families back in homes and children back in schools in the districts of Kathmandu, Sindhupalchowk and Nuwakot. The Nepali people are still in dire need and children are still unable to go to school or are attending unsafe, temporary schools. As a result, we have re-focused our efforts on one goal: getting the children of Nepal back to school. We reopened our Nepal Earthquake Recovery program after monsoon season and welcomed volunteers to help rebuild and repair schools in the Sindhuli district. Our reopened program focused on rebuilding the Shree Ma Vii School, the Shree Uccha Ma Vii School and the Saraswati school. Having successfully completed our work on the Uccha Ma Vii school, we have taken on a 4th school: Jana Jagriti Secondary School. Our efforts are focused on providing disaster-resilient classrooms, appropriate toilets and installing water filtration systems for safe drinking water. Our work is not done yet and we need your help to ensure a brighter future for the children of Nepal. Please donate or sign up to volunteer today! All Hands and Hearts has been working in Nepal since the 2015 earthquake devastated Nepal. Our long-term commitment to the communities where we work includes offering Skills Development Training to female masons. Our teams are currently working tirelessly to ensure that all plans are in place to begin the school rebuilds in October 2018. We will be rebuilding a 4-classroom, 2-story that will allow 190 students to continue their education, as well as a 3-classroom school that will enable 200 learners to return to a safe and disaster-resilient learning environment. Children may be placed in Temporary Learning Centers (TLCs) for years after a disaster if the original school was completely destroyed. Rebuilding schools entail the ground-up construction of permanent structures like classrooms, toilets, handwashing facilities, and retaining walls. We rebuilt 13 schools in Nepal following the 2015 earthquakes. 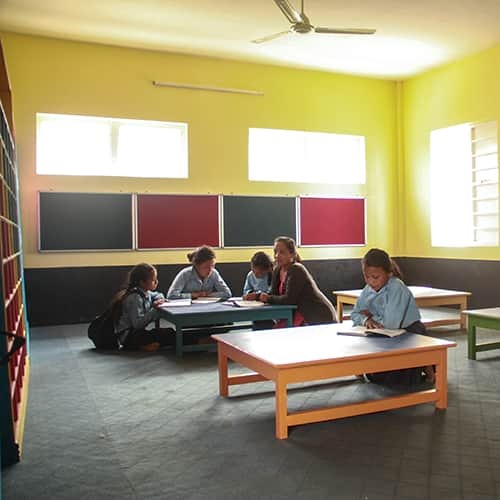 The objective is to construct safe, earthquake resilient classrooms and toilet facilities which would lead to an increased standard of education. An example is our Female Mason Program, where we worked on the accreditation process for female masons and prepared them for the skill set evaluation. All 32 masons participated in the Peace Technical Center exam and all 32 have passed it. Water Sanitation and Hygiene initiatives aim to improve the health of children and community members by reducing the incidence of water and sanitation-related illnesses. All Hands and Hearts has improved both the physical environment and cleanliness schools by adding facilities like hand-washing stations and toilets and also taught life skills and hygiene behaviours like tooth brushing. Dan spent four months in Nepal and shares his experience learning from local masons.